TV broadcast : France 5 in 2003. Selected by "Documentaire sur Grand Ecran". 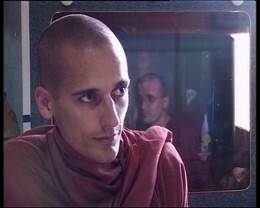 This road movie/documentary was shot in Burma, and shows the initiatory journey of Didier, a 31- year-old French man who used to be homeless, and who became an itinerant Buddhist monk. He then decided to live in isolation in a forest next to Mandalay for an unlimited period of time, maybe until the day he dies, so that he can experience the enlightenment.